(Trenton) With reports of West Nile virus illnesses in people at a record level and persistent warm and rainy weather, the New Jersey Department of Environmental Protection and New Jersey Department of Health are urging property owners to take steps to reduce mosquito populations and to protect themselves against the risk of mosquito-borne illnesses. Both agencies are also working coordinating with officials in Bergen County to continue monitoring, tracking and spraying efforts as well as public education. The county recently experienced two West Nile-related deaths. New Jersey’s 21 county mosquito-control agencies use a variety of methods to combat mosquitoes, including public awareness campaigns, larval habitat source reduction programs, use of natural predators, water-management techniques and careful application of approved insecticides to manage mosquito populations and reduce the threat of disease transmission. The Department of Health reports that human cases of West Nile Virus this year have reached a record of 34, two of them fatal. A 62-year-old man and an elderly woman, both from Bergen County, passed away in September, after being bitten by infected mosquitoes. Monitoring across the state also indicates record levels of pools producing mosquitoes and mosquitoes carrying West Nile virus. Like all mosquito control agencies, the Bergen County program is using comprehensive mosquito surveillance information to direct control decisions and aggressively treat for mosquitoes in affected areas. These efforts will continue until the threat of further disease transmission has passed. The virus is spread by the bite of a mosquito infected with the West Nile virus. 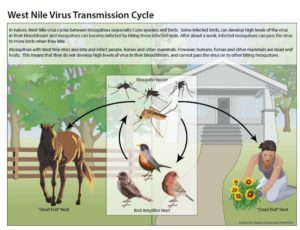 The virus can become amplified in populations of birds, meaning that a mosquito that transmits the virus to a person has bitten a virus-infected bird. This transmission route can also infect animals, often horses. 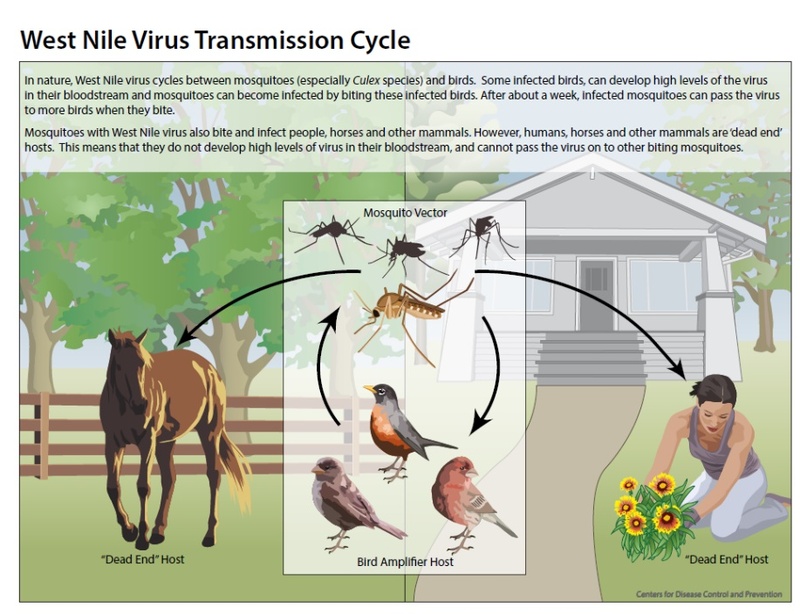 West Nile virus is not spread from person to person. Many people who become infected do not become ill and may not develop symptoms. About 20 percent of infected people will develop West Nile fever. When symptoms occur, they may be mild or severe. Mild symptoms include flu-like illness with fever, headache, body aches, nausea and sometimes swollen lymph glands or a skin rash on the chest, stomach and back. Symptoms of severe cases of West Nile virus include high fever, neck stiffness and encephalitis, a swelling of the brain that can lead to coma, convulsions and death. Less than one percent of infected people will develop severe symptoms. People over the age of 50 and people with weak immune systems are at greater risk of developing severe illness. Symptoms can appear two to 14 days after being bitten by an infected mosquito. There are no vaccines or specific treatments for most mosquito-borne diseases. Those who think they or a family member has contracted a mosquito-borne disease should call or visit a healthcare provider immediately. Empty water from flower pots, pet food and water dishes, birdbaths, swimming pool covers, buckets, barrels and cans at least once or twice a week. Clear clogged rain gutters.Check for and remove any containers or trash that may be difficult to see, such as under bushes, homes or around building exteriors. 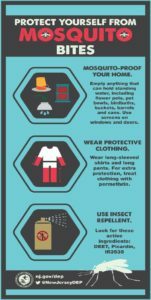 Use EPA-registered insect repellents when outdoors and wear protective clothing. 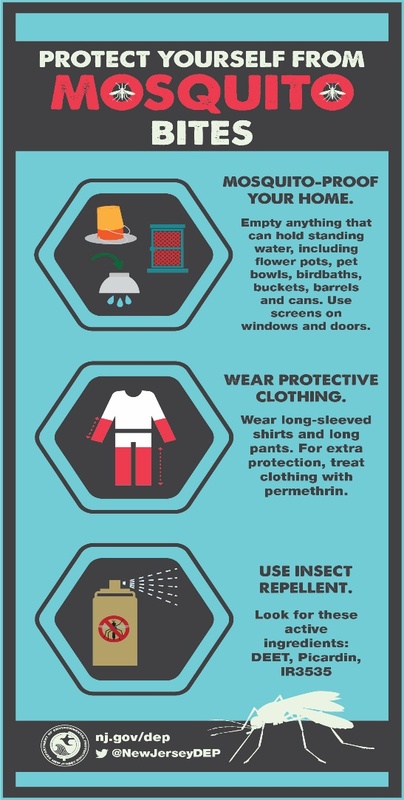 Stay in air-conditioned places or rooms with window screens that prevent access by mosquitoes. Drill holes in the bottom and elevate recycling containers that are left outdoors. Repair and clean storm-damaged roof gutters, particularly if the leaves from surrounding trees tend to clog drains. Roof gutters can produce millions of mosquitoes each season. Avoid allowing water to stagnate in bird baths. Aerate ornamental pools or stock them with fish. Water gardens become major mosquito producers if they stagnate. Clean and chlorinate swimming pools, including those not in use. An untended swimming pool can produce enough mosquitoes to result in neighborhood-wide complaints. Be aware that mosquitoes may also breed in water that collects on pool covers. Repair and maintain barriers, such as window and door screens, to prevent mosquitoes from entering buildings. Barriers over rain barrels or cistern and septic pipes will prevent female mosquitoes from laying eggs on water.